This picutre is one of a series sent to me by Sir Dayvd of Oxfordshire, Honorary Founding Father. Jousting is still alive and well, at least for now, in England. As Sir Dayvd shares, "Blenheim Palace is my next door neighbor in Woodstock. This is where Winston Churchill was born and lived. This is the beginning of a typical joust. They will sadly now be having a big review on Jousts in this country, as the other week a top Knight was killed by a completely freak accident when a tiny sliver of broken lance made it through his eye slit. 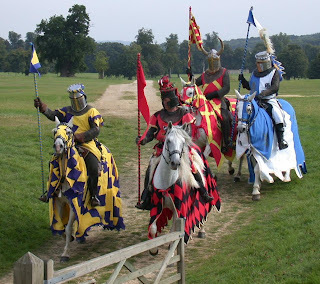 So whether we will see these jousts is in question; however, they will probably continue with modified helmets." We thank Sir Dayvd for these outstanding images and can relate first hand as to how a freak accident can change a life; however, that is life and it should be lived to the fullest, freak accidents and all!